The Great Dane is a true giant among breeds, having descended from the mastiff. The Great Dane was initially developed in Germany to hunt wild boar and other large game. The breed eventually became a common addition to large aristocratic estates in Germany as a guard dog and protector. The Great Dane was originally known as the boar hound when it first appeared in America in the 19th century. The Great Dane became an AKC recognized breed in 1887. While intimidating in size and stature, this is a breed noted for its gentleness and “human-like” compassion. They are highly intelligent and capable of performing all manner of working tasks and athletic challenges. Its impressive size, family devotion, and gentle nature combine to create a first-rate companion which makes this breed an excellent member of the family. The breed is highly successful in obedience trials, agility competitions, tracking, scent work, lure-coursing, and therapy work. Permissible conformation colors are black, blue, brindle, fawn, harlequin, and mantle. As of 2018, the Merle variety was accepted as the seventh permissible conformation color by the Great Dane Club of America. Great Danes are continuing to grow in popularity throughout the United States as both family companions and working dogs. Most notably, Great Danes can be found working as therapy dogs, service dogs, stability dogs, and medical alert dogs. Some have even honored their original breed purpose by working as wild hog hunters in the American southwest. 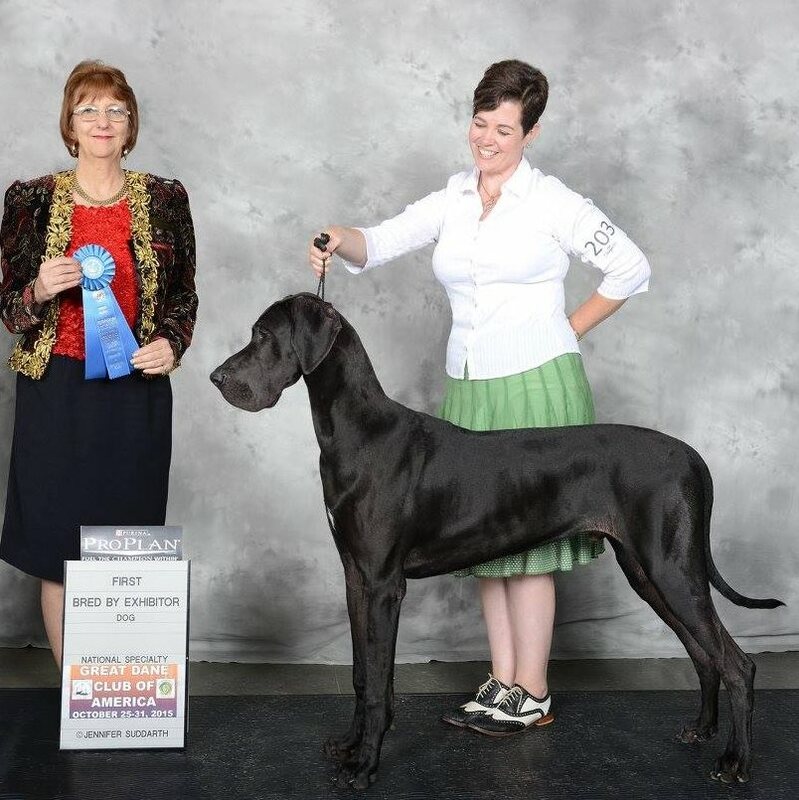 The Great Dane Club of Greater Dallas was created in the late 1960's to foster Great Dane good will, education, mentoring, and to promote participation in dog shows. The Great Dane Club of Greater Dallas was organized and incorporated in Dallas, TX in 1967 as an affiliate club of the Great Dane Club of America. The club received its accreditation from the American Kennel Club in December of 1967. The charter members of the club spent the next two years building its membership, holding club meetings, participating in many community activities, and working to complete the requirements of the AKC's approval process. The GDCGD received its approval and licence from the AKC to officially hold point shows in March of 1970. That same year, they held their first conformation point show & breed specialty on September 19, 1970 at Dallas Market Hall. ​The GDCGD has held an annual specialty in the DFW area every year since, as well as having hosted several GDCA National Speciaties. The club is now licensed to host trials in Rally Obedience, Companion Obedience, and FAST CAT. The underlying premise of holding our “conformation” shows is to assist reputable breeders to find the best examples of the breed for future generations. We strive to promote the best practices in breeding, rearing, raising, training, competing, caring, and loving of this magnificent breed. The Great Dane Club of Greater Dallas is an affiliate club of the Great Dane Club of America and the American Kennel Club.